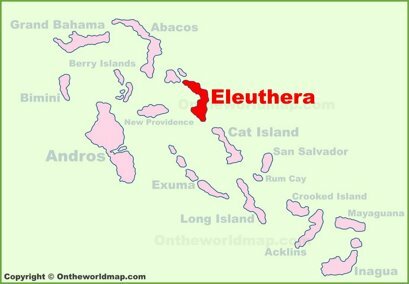 Major islands: Eleuthera and Harbour Island. 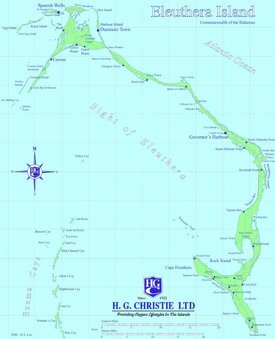 Towns: Bluff, Upper and Lower Bogue, Current, Gregory Town, Rock Sound, Greencastle, Alice Town, James Cistern, Governor's Harbour, North and South Palmetto Point, Savannah Sound, Winding Bay, Tarpum Bay, Wemyss Bight, John Millars, Deep Creek, Delancy Town, Waterford, Millar's and Bannerman Town. Area: 177 sq mi (457 sq km).